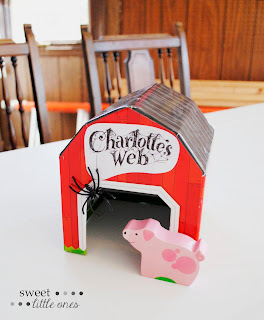 Charlotte's Web is one of our kids' favorites so I thought it would be the perfect theme for L's first birthday this past Spring! 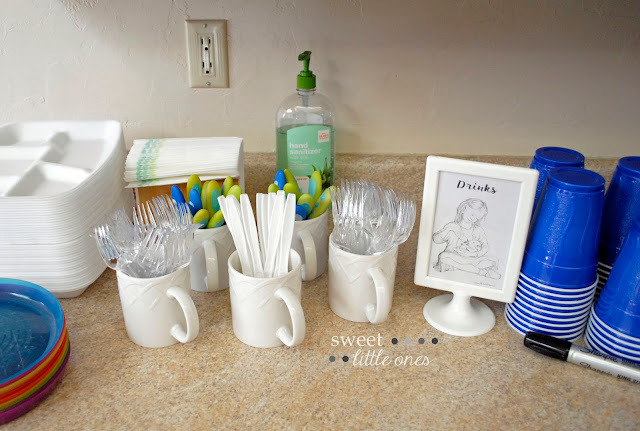 I knew it would be so cute - and also so easy and inexpensive to put together! Since Charlotte's Web is a book, I knew I could find the book's illustrations online so I could use them for the signs. And what kid doesn't have farm animal toys? You can't get any easier or cheaper than using what you already own. 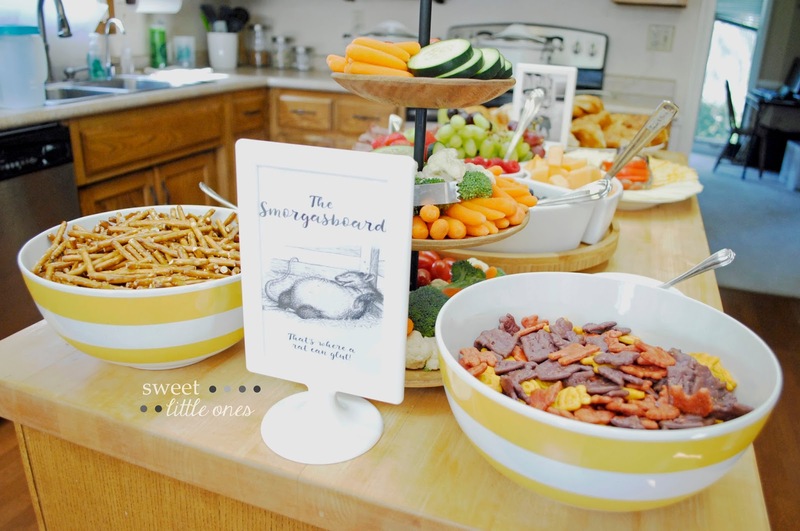 Plus, we chose farm fresh picnic food and farm animal crackers for the meal, all of which needed little to no prep. This adds up to a winner of a DIY birthday party in my book! 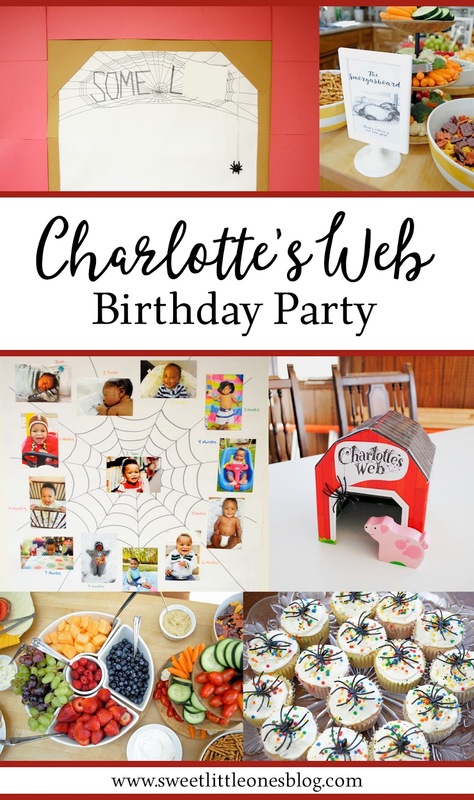 So here is L's First Birthday Party - Charlotte's Web style! 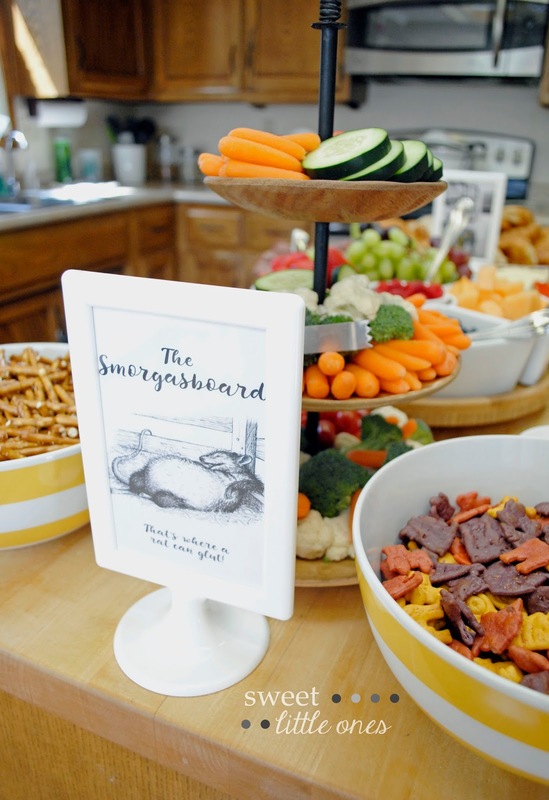 The Smorgasboard: That's where a rat can glut! For the food, we went very simple. 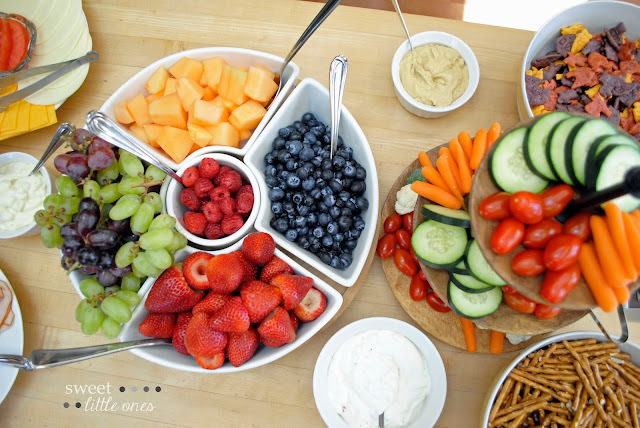 But I used pretty bowls and platters to make it look grand and beautiful! 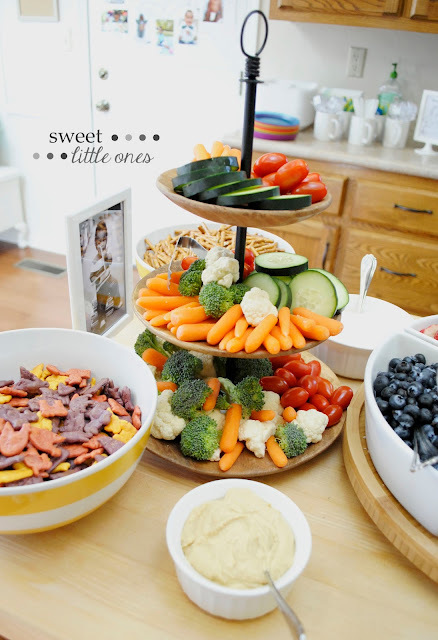 We had a lot of finger foods, including raw fruits and veggies, pretzels, and Annie's farm animal cheddar crackers (which features barns and pigs). We also had baked beans, meatballs, and cold cut sandwiches. 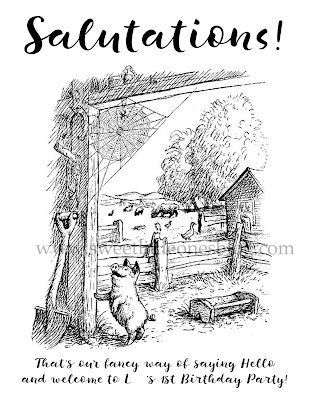 But we did not have ham because Charlotte saved Wilbur! I'll admit that I'm not very good at cake decorating. So spider rings were the perfect solution! Now for the party decor! 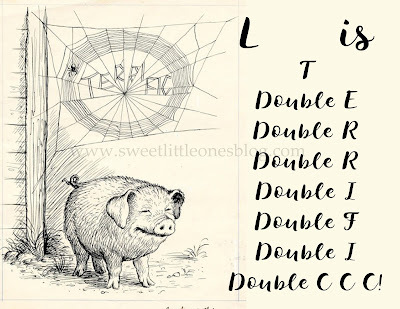 I made all of the Charlotte's Web birthday signs pretty easily. 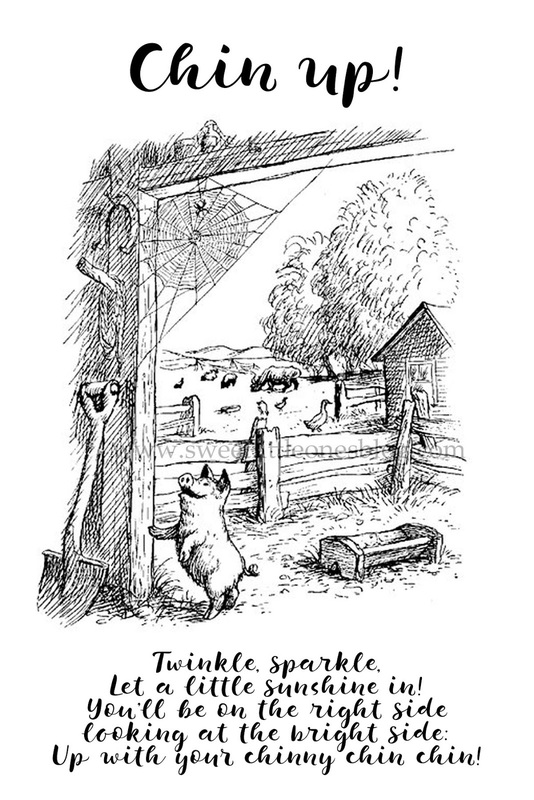 I found the pictures from the book through a Google search online. I then added my own wording to them in Photoshop (but you can do it in any photo editing program, like PicMonkey or Word). Our Welcome sign: Salutations! That's our fancy way of saying Hello and welcome to L-----'s 1st Birthday Party! 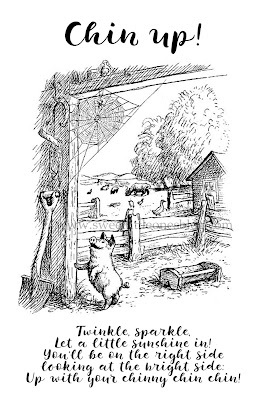 The kids' favorite line in the movie comes from the Goose when she spells TERRIFIC for Charlotte. 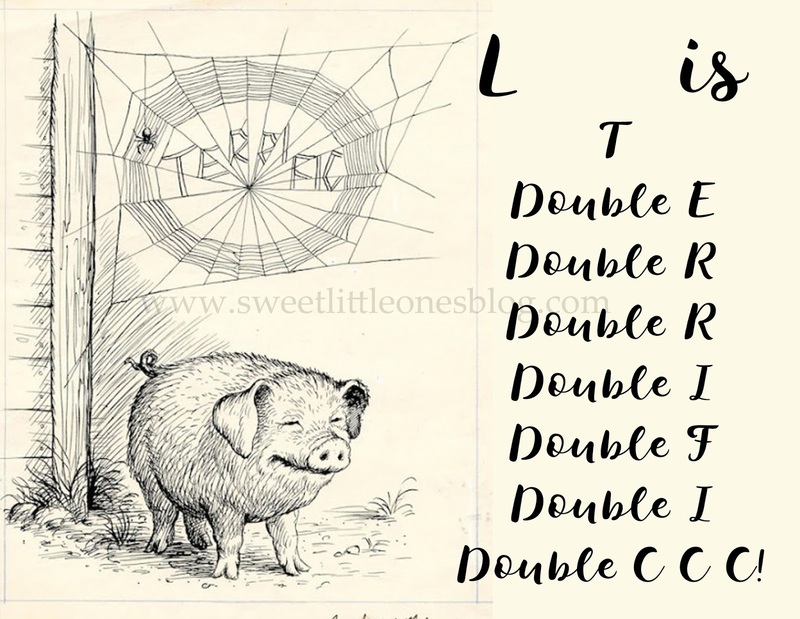 So we just had to spell it her way: L------ is T - Double E - Double R - Double R - Double I - Double F - Double I - Double C C C! Our favorite song: Chin up! Chin up! Everybody loves a happy face! Fern bottle feeding Wilbur as a piglet by the drinks. Templeton glutting at the fair to start off the buffet line. The Smorgasboard: That's where a rat can glut! Wilbur being RADIANT and saying Thank you for coming! These white stand up IKEA frames are double sided so I put pictures of L on the back side. On the one in the picture above, I put a picture of him "eating" his book on the back side of the The Smorgasboard sign. 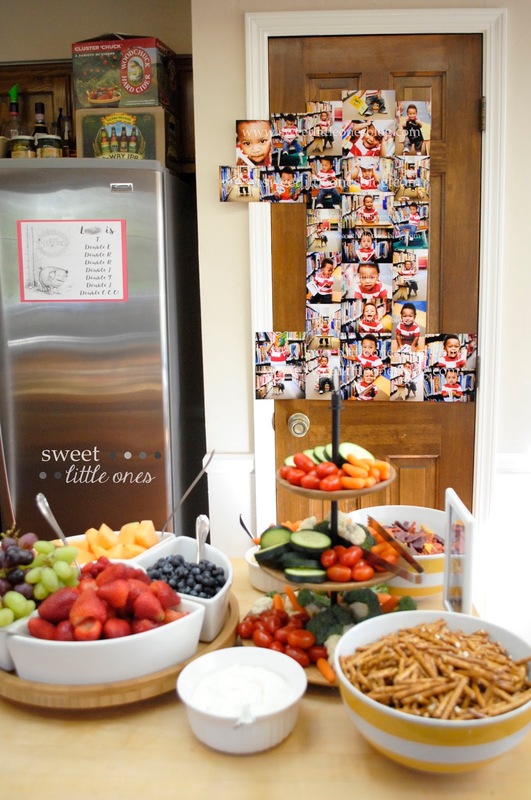 I absolutely loooooove using these IKEA frames for parties! They're perfect for table centerpieces because they're double sided. 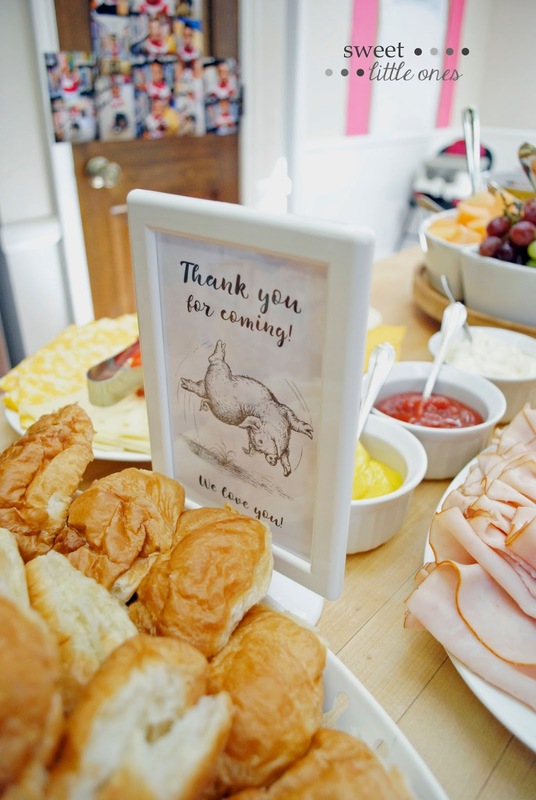 They're perfect to label the buffet line because they're slender (and double sided). Plus, they are really inexpensive! 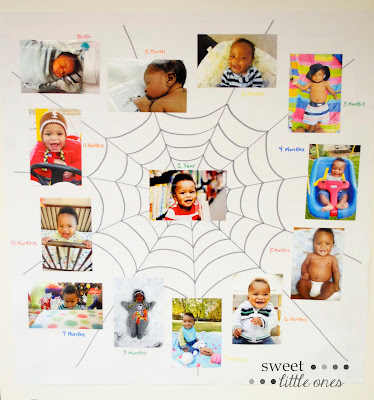 As a fun way to show off all of L's one year pictures, I put them all up in the shape of the number 1. I also laid out several extra pictures of him for family to take home. To display L's monthly pictures, I drew out a spider web and put his pictures from birth through 11 months all around the outside and his 1 year picture right in the center! I really love how both of his picture displays turned out! 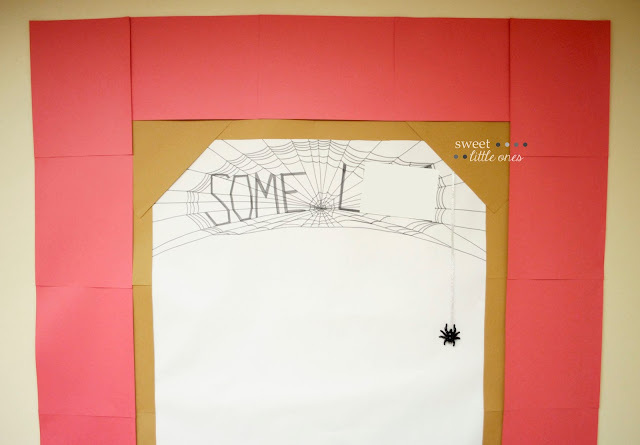 I printed off some illustrations of the cover of Charlotte's Web to fancy up this decor as well! And last, but not least...!!! 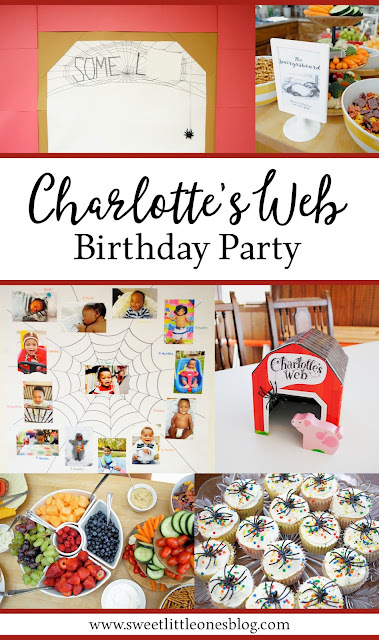 L's Charlotte's Web Birthday Banner!!! I guess I fibbed a little because the big birthday banner definitely was not simple. It took some time to make. The outside border is just uncut construction paper made to look like the open door of a barn. That was the easy part! I then drew SOME L------ (my son's name) in the spider web to look like Charlotte's SOME PIG. I drew it in pencil first and then outlined it in a black marker. This took me well over an hour (maybe two) to draw it out to my liking. I then hot glued a plastic spider to some silver ribbon and had it dangle down the front. It was worth the time and effort - I love how it turned out! I'm all about easy and inexpensive when it comes to birthdays. I always use what I have on hand to make the decor, and I always serve easy-to-make food. 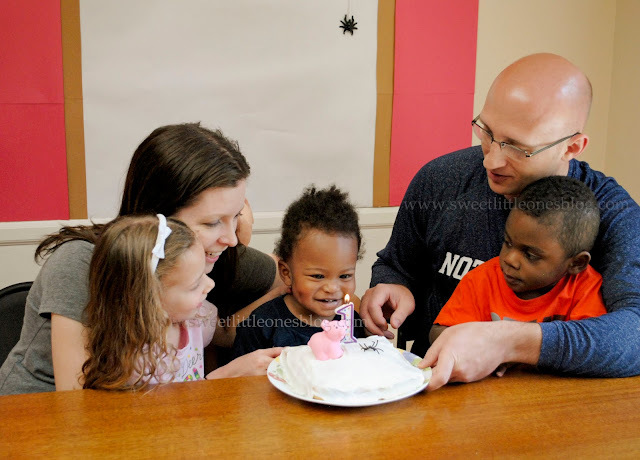 A birthday party should be all about celebrating and being with family, not over-spending and stressing about party planning! 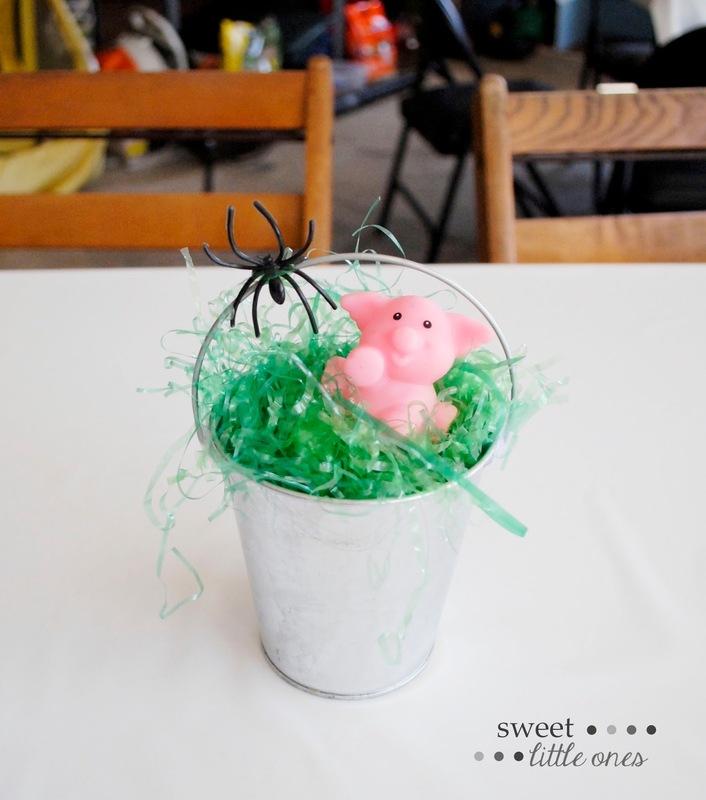 And I think this Charlotte's Web birthday party turned out to be super fun and super sweet! 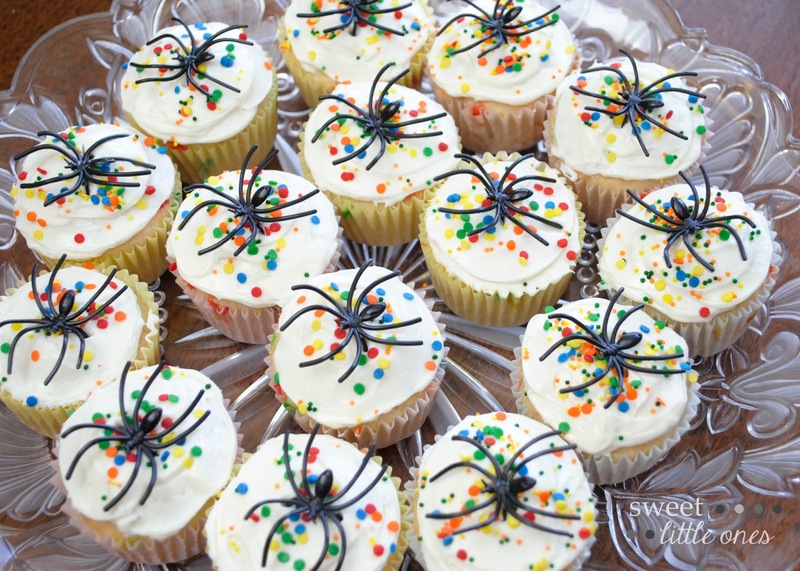 What's your favorite birthday party theme? What are your keep-it-simple party tips? Don't miss out on the Dating Diva's Fall Favorites Printables Bundle that goes live this Wednesday, September 21st! And as my bonus to you, you will receive 2 more printables from my shop if you make a purchase through my link! Mark your calendar! I'll see you back here on Wednesday!